Holiday season is in full swing. The Orchard Road lights are lit to the tunes of Frozen and Toy Story, and we’re almost sick of listening to Jing Bell Rock blasting from 10 shops in a row. 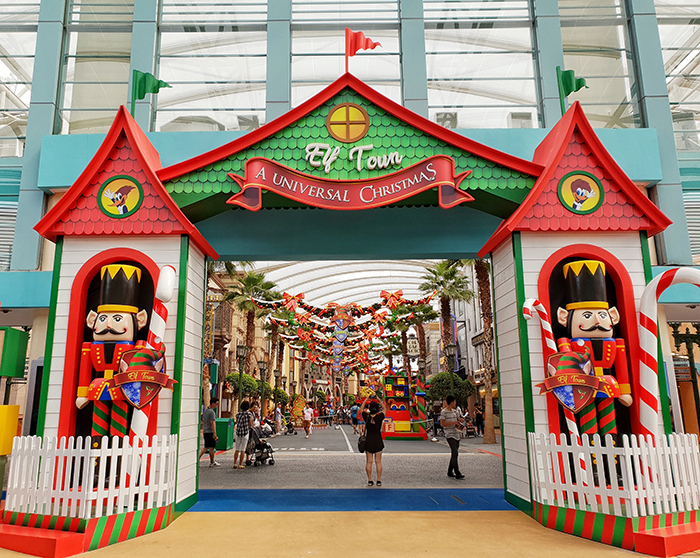 And right on cue, Universal Studios Singapore are also prepping for the festive season with dazzling light displays, new parades and performances, and of course, fireworks. You can maximise your time in the park as there will be extended park hours on certain nights till 10pm, with the Christmas Fireworks Spectacular show to end your night with a bang. Elf Town is now open! When you step into the park, you’ll be greeted by Santa’s loyal helpers and huge, colourful toys. Huge gingerbread men and houses are peppered everywhere – although they are not for eating! Dress up in your Christmas best, and you might even be able to help out at the toy factory with Chester Chestnut and Sugarplum Mary. 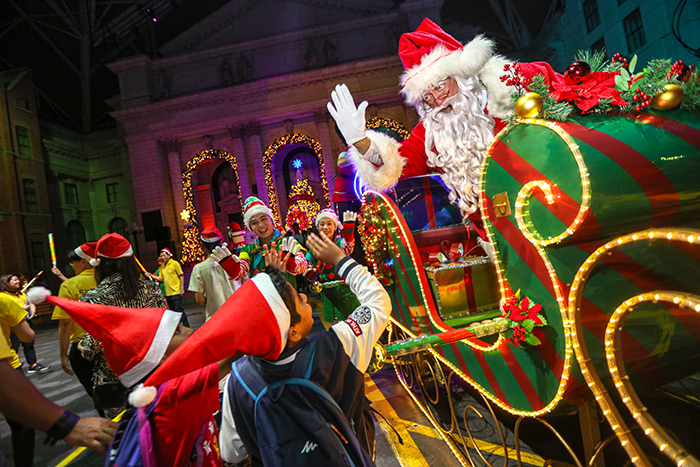 The parade is often the highlight of every trip to Universal Studios Singapore, and this year’s Christmas Parade is said to be their biggest yet. Santa will be riding in his huge sleigh to meet fans and park-goers in Santa’s Snowy Sleigh Ride. Expect even more dancing, tunes and huge floats! Other than the main road New York, the rest of the park will also be adorned in festive decor – more specifically Madagascar and Far Far Away. Do drop by to see the festive splendour for yourself! At one end of Elf City, it’s PRESENTation Day. 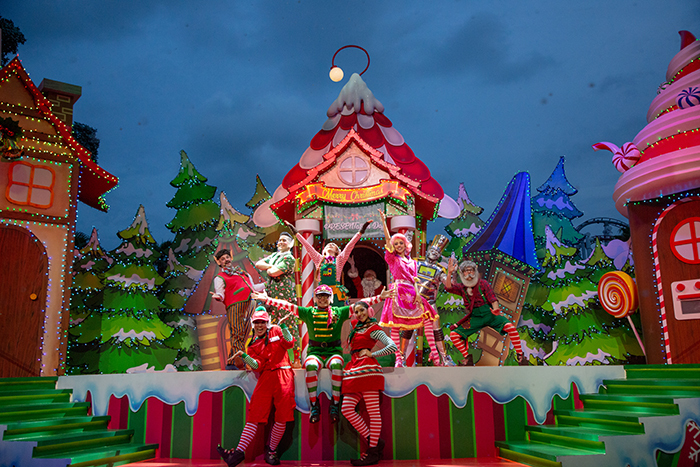 The new show follows a toymaker as she attempts to prove herself to Santa amidst lots of dancing, singing and colourful costumes. The scrooge of the park, Oscar from Sesame Street is intent on being as miserable and grouchy as possible. Do catch Oscar’s Grouchmas Show to watch him learn all about the power of kindness as he becomes the #1 fan of Christmas. For more cheerful fun, head over to King Julien’s tropical Merry Mambo Christmas Party to boogie to the beat. The rest of the Madagascar gang will partying it up, along with Betty Boop & her friends and Marilyn Monroe in their various Christmas shows. It’s going to be lots going on this Christmas over at Universal Studios! Singapore Residents get discounted tickets at $72 for a daily ticket, plus a limited edition EZ-link card and a complimentary $5 retail voucher. Book your tickets through Klook for cheaper tickets and 5% rebate. Guests entering the park after 5pm can also get discounted tickets. Book tickets through Klook and use our code “NYLON5” to get $5 off for first-time users!